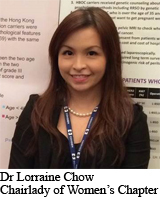 The Women’s Chapter was established in November 2008, with Dr Ava Kwong as founding chairlady. In 2008, the College recognized that there was an increasing proportion of females being admitted to medical school and that it was important that Surgery attracts the most elite in both genders into the field of surgery. The Women’s Chapter has been formed to address female specific needs so that a surgical career can become more appealing to all. Our mission is to promote surgery as a career for women and enhance professional advancement amongst female surgeons. We also aim to facilitate social, clinical and academic interactions amongst women surgeons and to encourage a balanced lifestyle so that women will be able to excel in a surgical career and yet can still enjoy a good family life.